I m making boondi for the very first time. 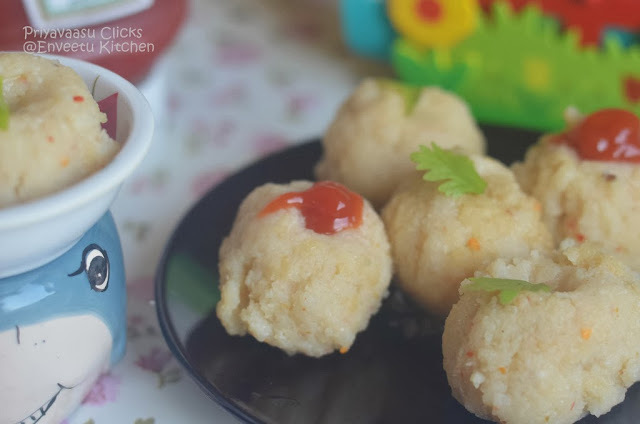 I had a serious block that they are very difficult to make, though i had these laddu jharini's for the past 2 years, i didn't had the guts to try them. 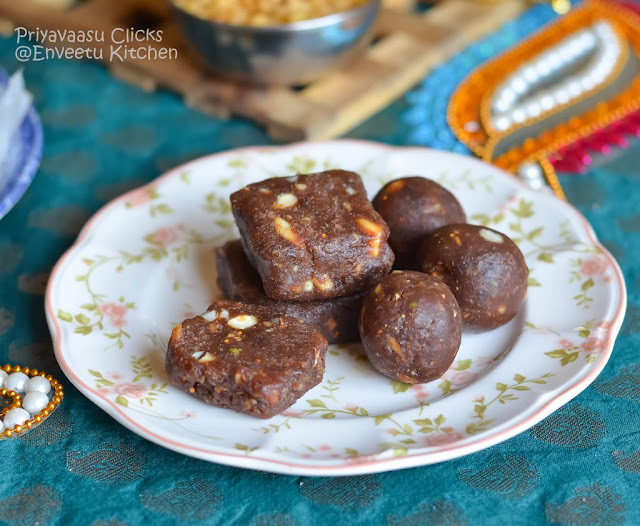 This year, when i decided to make some sweets for Diwali, i thought of giving it a try, So last weekend, gathered all my guts and made a small batch. Oh, they weren't that difficult at all, if we get the batter consistency right, it is an easy breezy recipe. The excitement of learning something new and getting it right, it is indescribable. Bala is so excited to gobble up these well seasoned crunchy balls, he is all the more excited to try some new food everyday!!!! 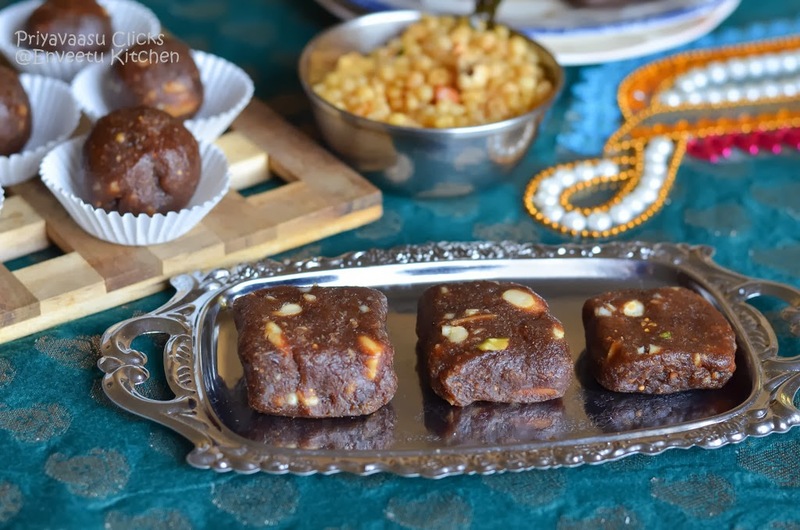 So, this Diwali i learned a new recipe and was happy that it turned out good. 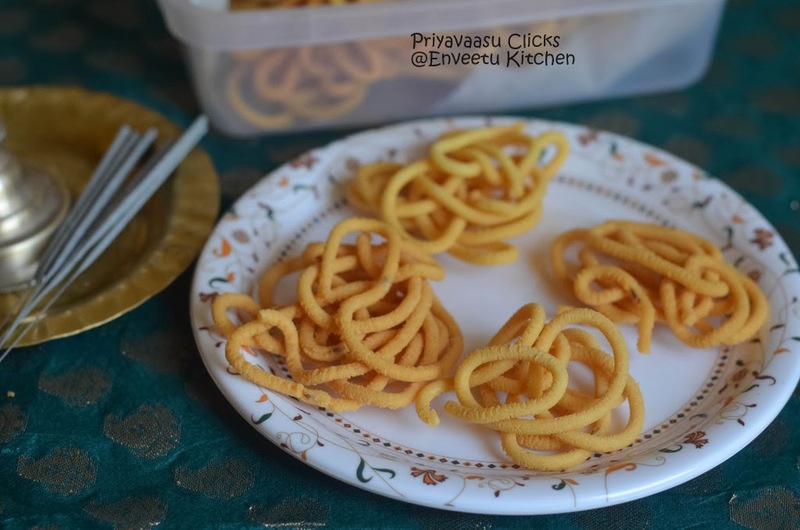 What new recipe, did you learn this Diwali??? Sieve together Besan/Gram flour, rice flour,salt in a wide bowl. 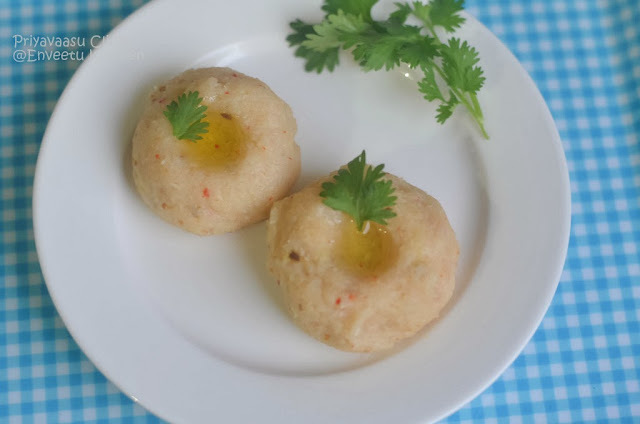 Add water gradually to make a batter like Idly batter. Do not add water all together at the same time. Add little by little to reach the consistency. Heat oil in kadai. 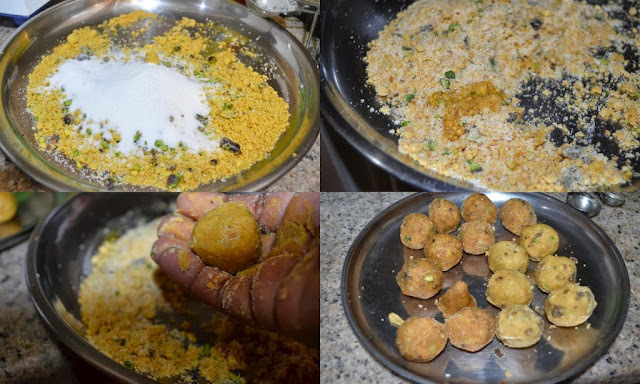 I have the special laddle used for making boondi, called laddu jharini. Its ok if you don't have one, you can use two big slotted laddles. One for making boondi and one for draining it from oil. And another deep ladle to spoon the batter. Keep the slotted laddle right on top of the Kadai, Pour one deep-ladle of batter over the slotted ladle and spread it. you can see pearls of flour dropping in the hot oil. 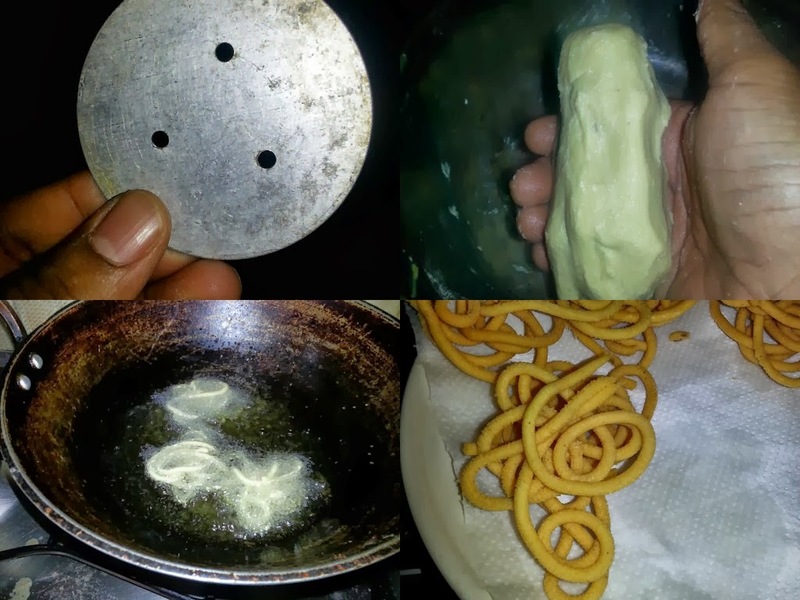 Fry with constant turning to ensure even cooking and drain once the sizzle ceases or until golden colour.Drain using other big slotted ladle in kitchen towel. Repeat the process to finish the remaining batter. Once done, transfer the boondi in a wide bowl. 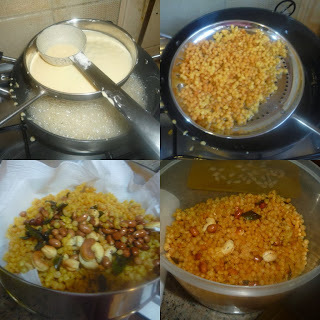 Heat Ghee in another pan, when hot,add curry leaves, hing, broken cashews, peanuts and fry till golden. At the end, add half the pepper powder and give a quick stir, take it off the flame. Add this to the boondi, add the remaining pepper powder and little more salt and toss well to get all mixed. While making the batter, do not add all the water at the same time. 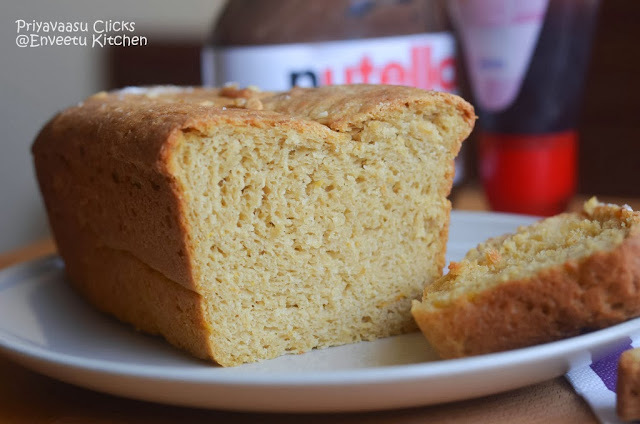 How to know the right consistency of the batter? 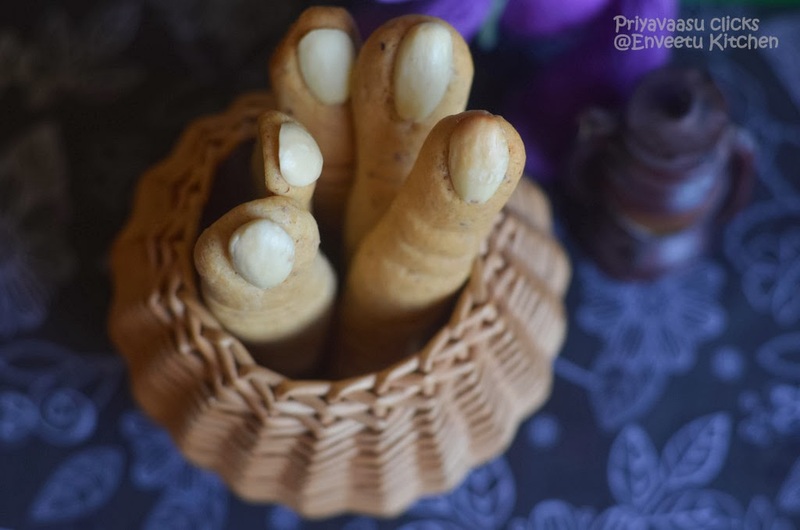 When you spread it through the slotted laddle, if the boondi's have tails, then the batter is too thick, add little more water to make it a bit thin. 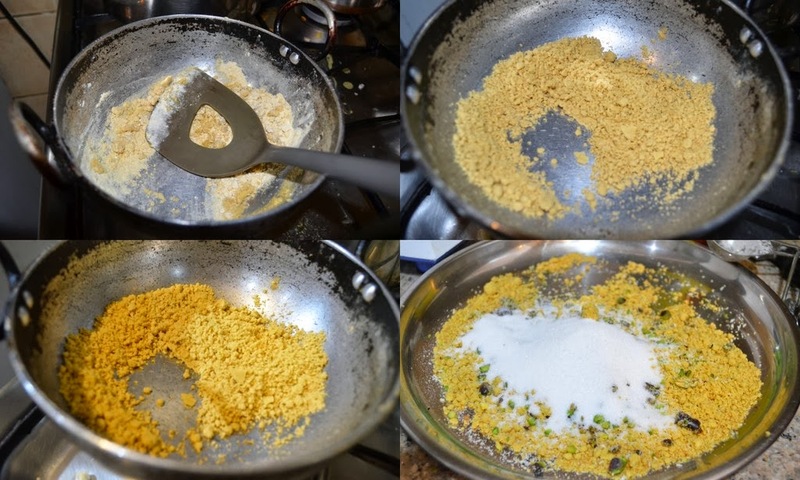 if the boondi's fall flat, then the batter is too thin, add little more besan/gram flour to make it correct. 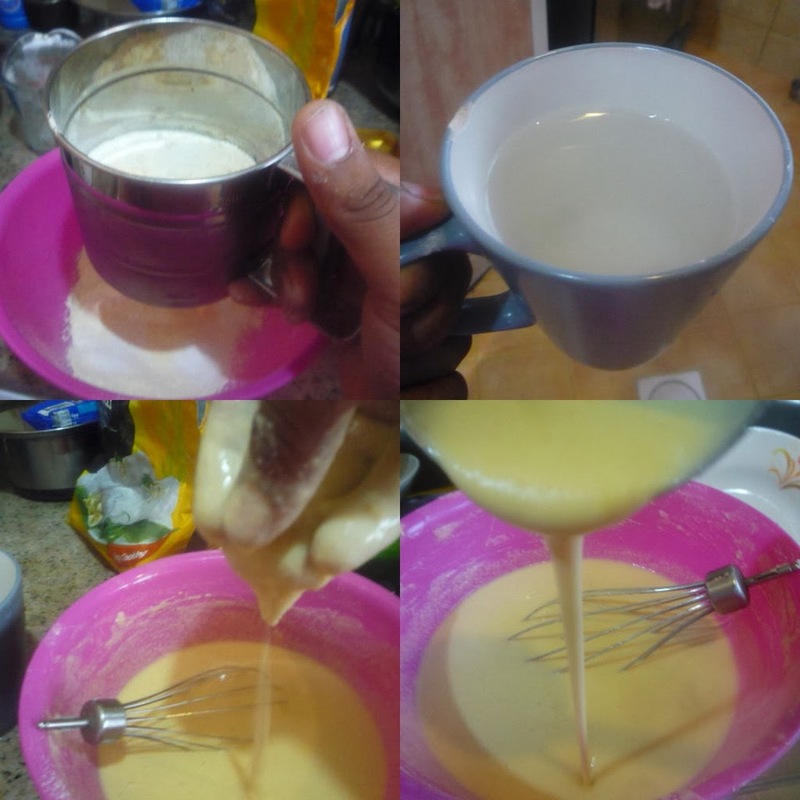 Another way, is when you pour the batter in the laddle, it won't fall until you spread the batter. This is my personal observation, May not work for others. But the former is the correct way to check the consistency. We don't prefer garlic in Boondi, so i haven't added any, If you prefer the flavor of garlic, then go on and add 3-4 flakes of crushed garlic while doing the seasoning towards the end. 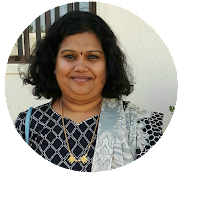 Poondu Kuzhambu brings fresh memories to me always. Most of the sundays during my childhood was spent @ my aunt's place with all my cousins together. My aunt makes awesome poondu kuzhambhu that has that incredible red color, the signature of the kuzhambhu. 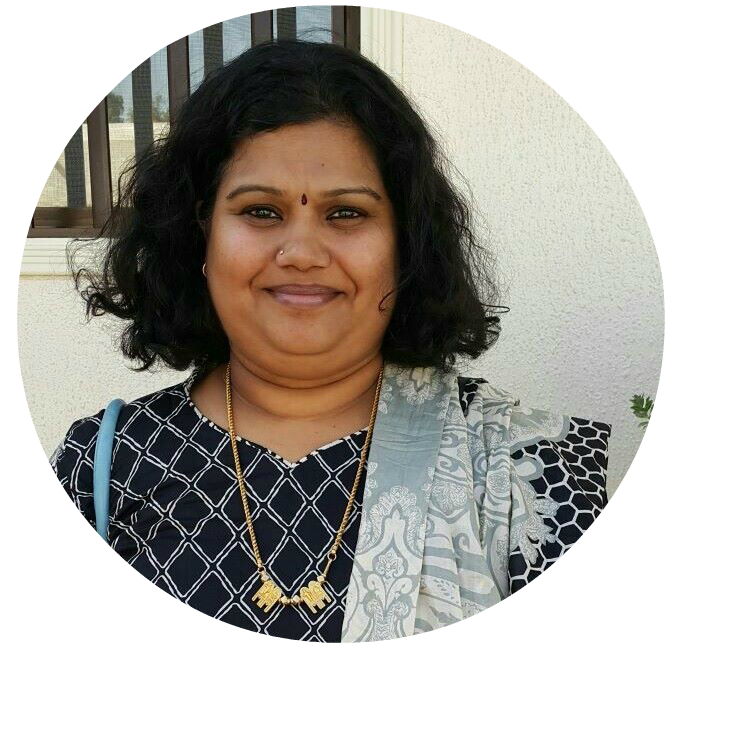 She makes this kuzhambhu on sunday's for us all to enjoy. Later when i started to cook, i used to wonder why am i not getting that color what she gets?. Out of curiosity, i asked her one day what do you add extra to get that color, then she told me the secret and Voila!!! i too get that same color when i make Poondu Kuzhambhu!!! 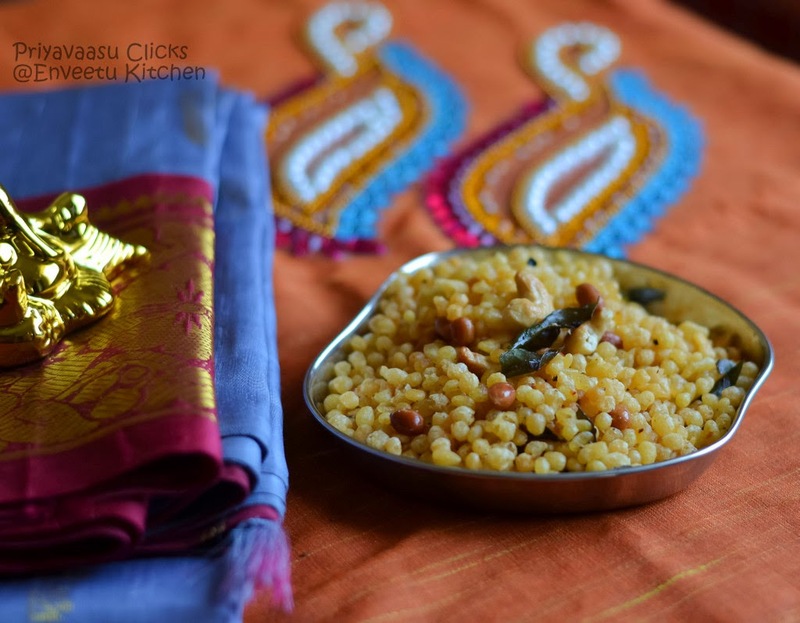 Here is that recipe which i have scribbled in my recipe diary which i brought with me as a new bride, married to a person, whose family eat, talk, walk and breathe Food and to whom there is no such thing as little when it comes to food!!! Soak Tamarind in warm water for 10 minutes and extract approximately 3 cups of water. The Amount of tamarind depends upon the variety of tamarind you are using. Some might be very tangy with small amount, some might be otherwise. So soak and extract accordingly. The Variety i used is very tangy. Heat oil in a Deep pan/Kadai, splutter mustard seeds, add methi seeds/fenugreek seeds, followed by ajwain, hing and curry leaves.Take care not to burn methi and ajwain. Next add garlic and saute till they change color a bit and nice aroma of sauteed garlic emanates. Add chopped pumpkin and chopped tomatoes to this and saute till tomatoes release oil. Let this cook in a medium flame for 10 -15 minutes, after which the pumpkin must be 3/4th cooked, add salt now and mix well. Let this be on the stove until the kuzhambhu thickens and oil releases on top. Take it of the stove. 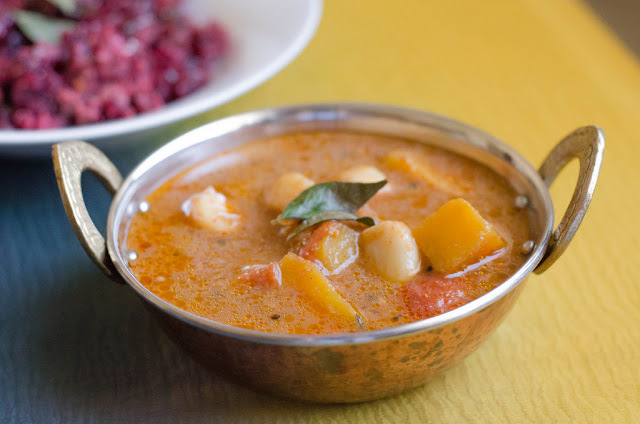 Serve hot with Rice and Pappad for an wholesome meal. 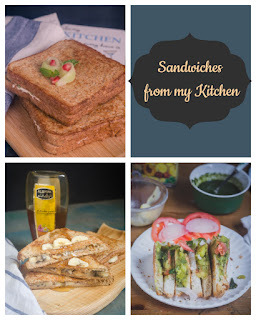 Sendintg this to Let's brunch on Sunday's and Cooking from a Cookbook Challenge. 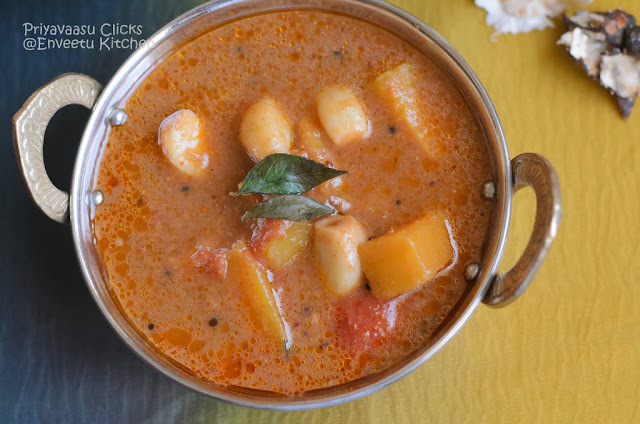 If you prefer the kuzhambhu to thicken fast, you can a tbsp of rice flour mixed with 1 or 2 tsp of water and add it to the kuzhambhu after adding salt. You can substitue Pumpkin with Brinjal/Drumstick or even shallots and garlic alone. In our home, we all love dried fruits, all kinds. Even Kuttu loves to snack on Dry fruits than on biscuits. I made these Bars/Ladoos as part of Diwali Sweets, especially for kuttu. These are quick to make, don\t need to sweat before the stove for long time. At the same time, they are great in taste and health. Figs contain a type of antioxidant called phenols, which may lower your risk for heart disease and cancer by preventing cell damage by dangerous free radicals. Fiber lowers your risk for high cholesterol, heart disease and constipation. The fiber in figs may also help you lose weight since it makes figs more filling, helping you eat fewer calories. 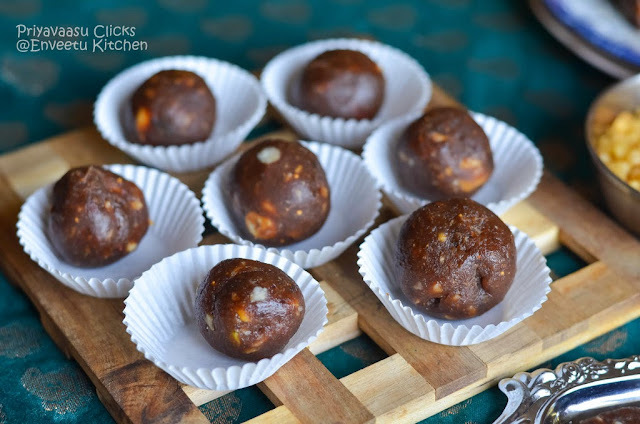 Dates on the other hand is rich in dietary fiber, which prevents LDL cholesterol absorption in the gut. They contain health benefiting flavonoid polyphenolic antioxidants known as tannins. Tannins are known to possess anti-infective, anti-inflammatory, and anti-hemorrhagic (prevent easy bleeding tendencies) properties. With so much health benefits, why not include them as part of our festivities and make it a healthy celebration. Soak Figs in Hot water for 5 minutes. Drain. 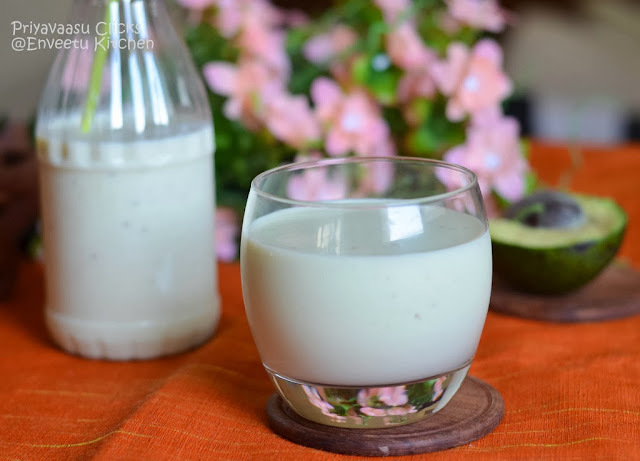 Take it along with dates in a blender/mixer and blend smooth. 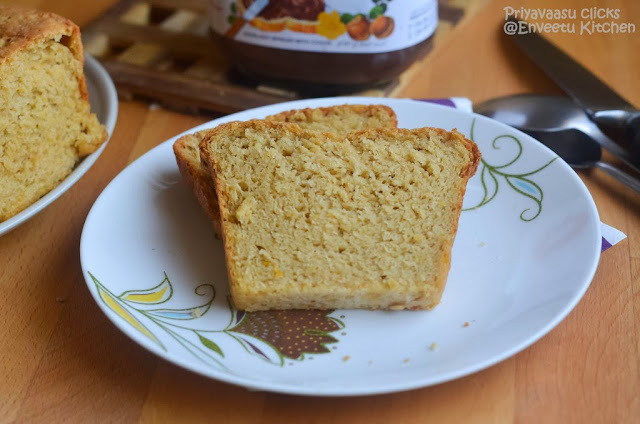 Grease a Flat plate/Loaf pan with ghee or simply line it with parchment paper. In a heavy bottom add 2 tbsp of ghee. add the chopped nuts and toast. When they start changing color, add the ground figs and dates paste to it and mix well. Let this mixture cook in a slow flame. Keep Stirring to avoid burning. Do not be tempted to increase the flame. After 10 minutes,the mixture will start coming together with the laddle as mix. 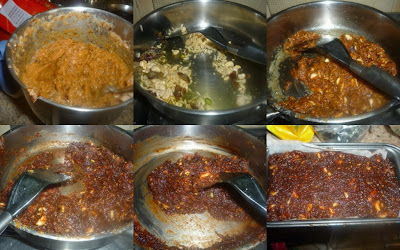 add the remaining 2 tbsp ghee and dessicated coconut and keep stirring. When it comes together as single mass. take it off the flame and pour it in the greased plate/loaf pan. Smooth the top with a greased spoon. Let it set for an hour. Invert it on another plate and cut them into squares. You can even make ladoos out of it. Instead of pouring it in a greased plate, you can let it cool in the pan itself. when it is warm enough to touch, make ping-pong sized balls out of it. Store them in an air-tight container in the fridge. 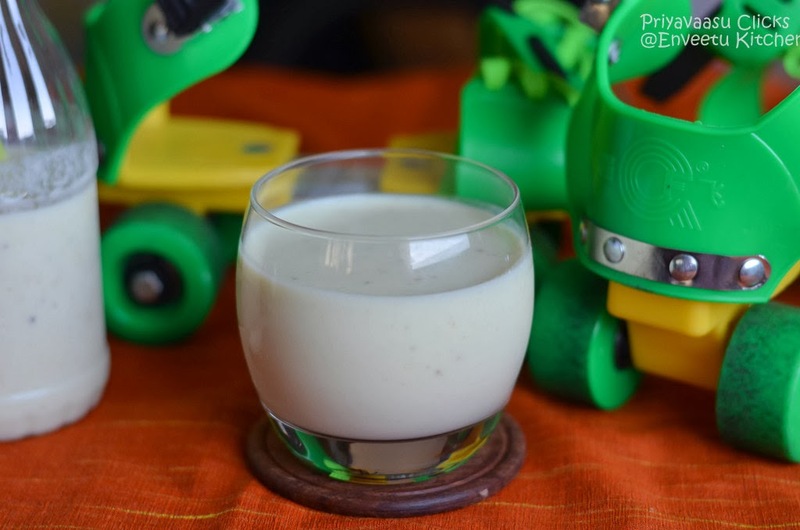 For the last week of BM33, i will posting recipes under the theme Kids Deight- Food for growing sports enthusiasts. You must thinking i m crazy to post something Chocolate under this theme. yeah, i know. But, why not? If we want our kids eat something healthy, why can't we mask them into something which they like. So, here is my try to make my son eat some fruits. He has recently joined Rollerblades class. Duration of the class is 1.5 hours. But, my lil hero, gets easily tired after 10 minutes of bending and practising. Though he eats only home-cooked food, but when it comes to fruits, he has that block, he likes only banana. Banana is also healthy, but don't get bored eating it all the time!!! So, i made these Chocolate Apples for him and coated it with his favorite Nuts. I took care not to overload it with nuts, coz, he is all the more like his dad, his hands shouldn't get messy while eating something. So, did it Work? yes, you can say 50-50. Here is some info that says Apples are great for athletes from WWW : Apples contain sugars that can help boost blood glucose levels, providing athletes with an energy boost during games. These sugars are easily absorbed into the bloodstream but aren't so high that they'll lead to a crash later on. Scrub and Wash the apples well. Using a Shape Knife, Core the apple. 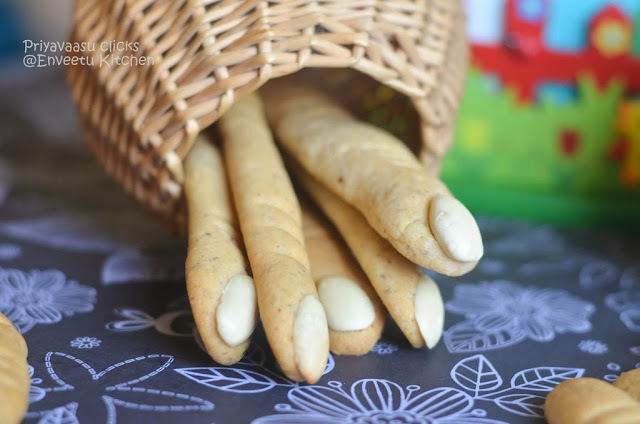 Insert ice-cream stick/satay stick in the center and refrigerate for 30 minutes. Take Chocolates in a Microwave Safe Bowl, Microwave @ Power High for 2 minutes, Remove and Whisk well to get a smooth liquid. Do Not add water/milk. Keep an eye after 1 minute. 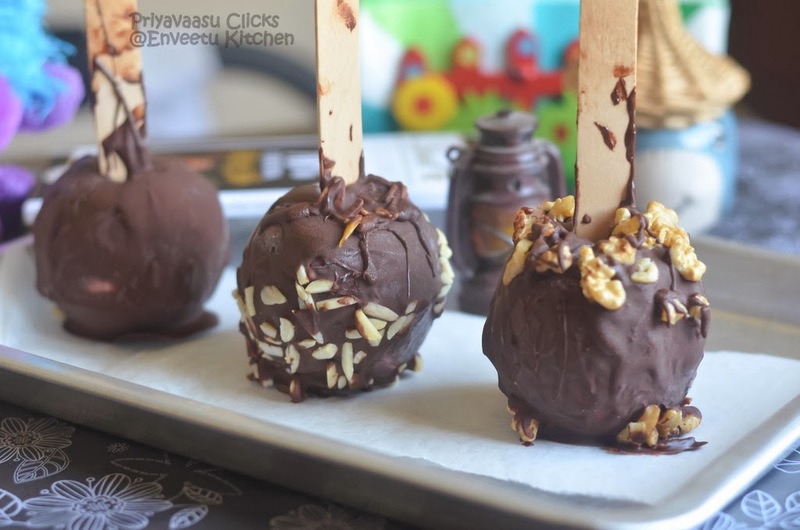 Take the bowl out and whisk well and take the apples out of the fridge, Dip them in Hot chocolate. 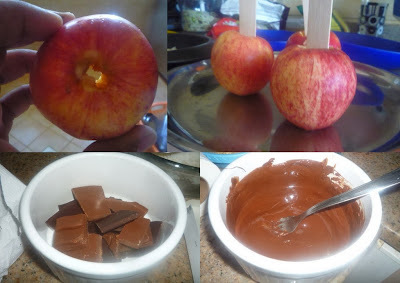 Swirl the apples and coat evenly on all sides, use a spoon and pour the chocolate over the apples to cover the top-side. Immediately roll the apples over the Nuts and Place it on a parchment-line tray. Refrigerate until devouring. Try using a more Deeper Bowl for melting the chocolate. Coz, it will help you to dip 3/4th of the apples. Since i used a Flat-based Bowl, i used a spoon to pour the chocolate over the apples to coat it till the top. I have used 50-50 Dark and Milk Chocolates. 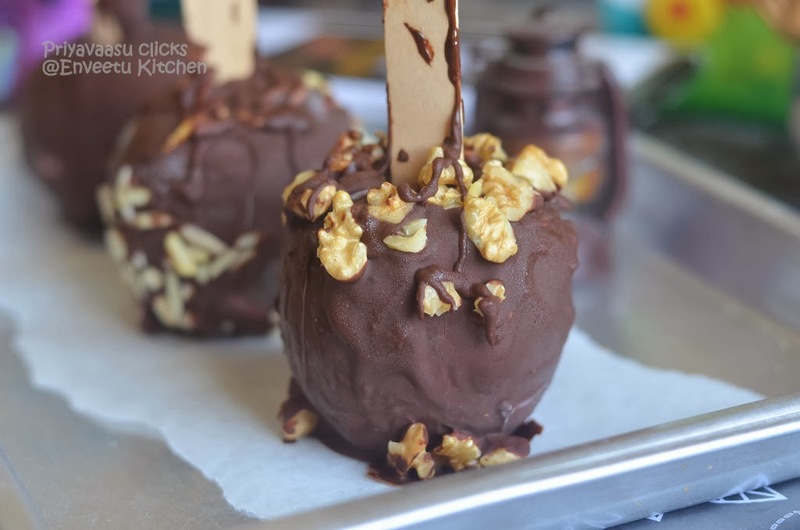 you can try using fully dark/milk chocolate. 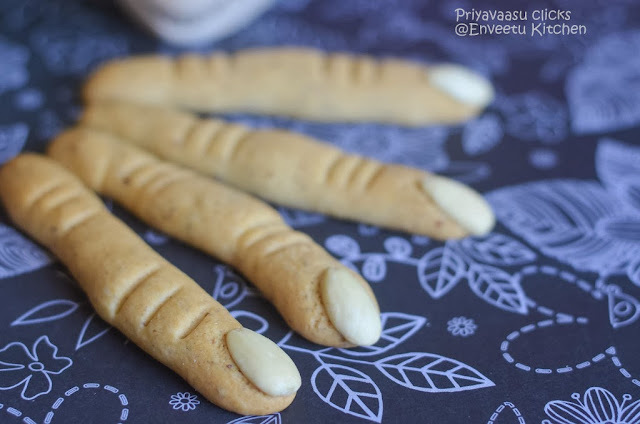 Kuttu wanted me to bake something spooky for halloween. I don't know where does he learn the term halloween. He wanted me to make Vampire Cupcakes or Ghost cakes. Luckily this month's Home Baker's Challenge too was Halloween themed and Nalini suggested Spooky Witch fingers recipe also. When i showed him that, he asked me to bake it for him. But had his conditions. The almonds must be peeled and it should be only half almond in a finger, coz that will only look like a nail it seems!!! hmm, Kids these days!!! He also wanted me to color the fingers green, since i was against using artificial colors, i said "No" to that alone.Here you go, Spooky Fingers for Halloween!!!! Mix Flaxseed meal and hot water together and keep aside until use. Soak Almonds in Hot water for 30 minutes. Remove the peel and keep aside until use. Sieve together All Purpose Flour, Salt and Baking Powder. In another bowl, Using a Electric beater, cream butter and sugar until creamy/Fluffy. Add the Flaxseed water to it and beat well to mix. Add Sieved Flour, Vanilla extract and mix well using your hands. The dough will be very soft and will come together very easily. At this stage, cling-wrap the dough and refrigerated for 20 minutes. Preheat the oven to 170C. Pinch a gooseberry size balls out of the dough and roll it into a 3.5 inch rope. place it on the baking tray. Using the blunt side of the knife make markings on the dough for knuckles. You can also pinch on the sides of the markings to make it little bulge and look like knuckle. Stick an almond for the nail. Repeat the same with the rest of the dough. 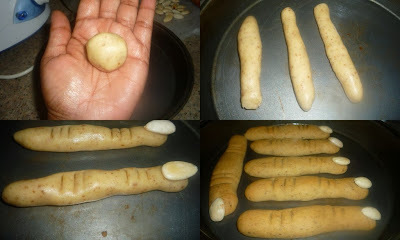 I made fingers out of the entire dough and baked them in batches. i baked 8 @ time and Kept the rest of the fingers in the fridge until use. 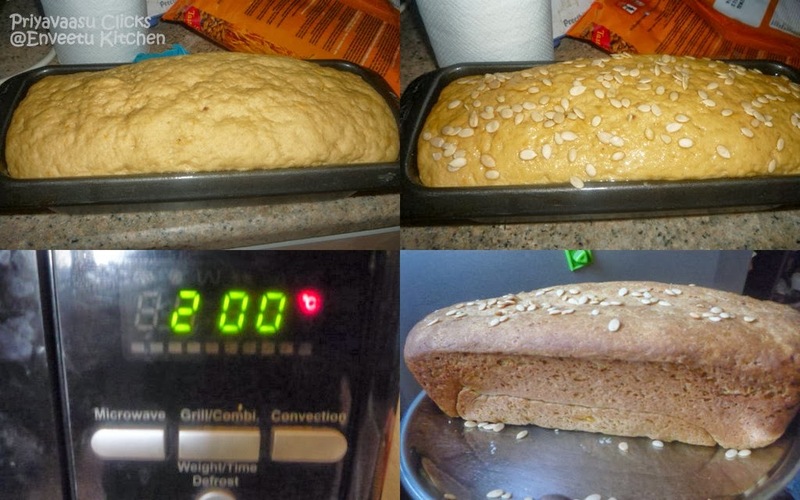 Bake for 16-20 minutes depending on your oven settings. Keep an eye after 16 minutes. Mine were done after 17 minutes. Take it out when it starts browning on top. It will be little soft while taking out, it will turn crisp once cooled.let it cool on the wire rack completely, then store in an air-tight container. 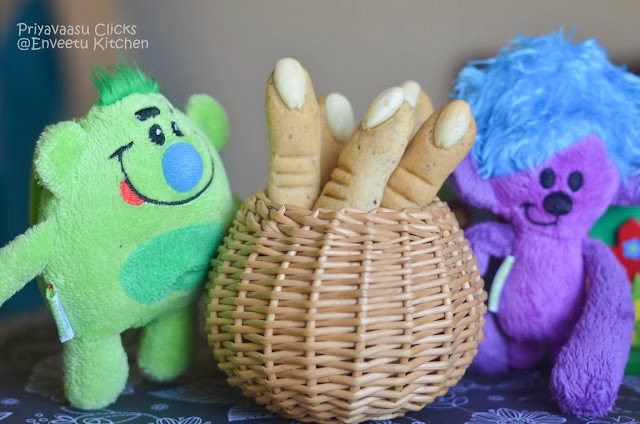 Makes an excellent evening snack for kids. I have this Non-fried Snacks Cookbook from Tarla Dalal, since 3 years and i would have cooked maximum 3/4 recipes from it. So, for this week's Cook from Cookbook Challenge, i chose to make this Quick to make Khichu from that book. 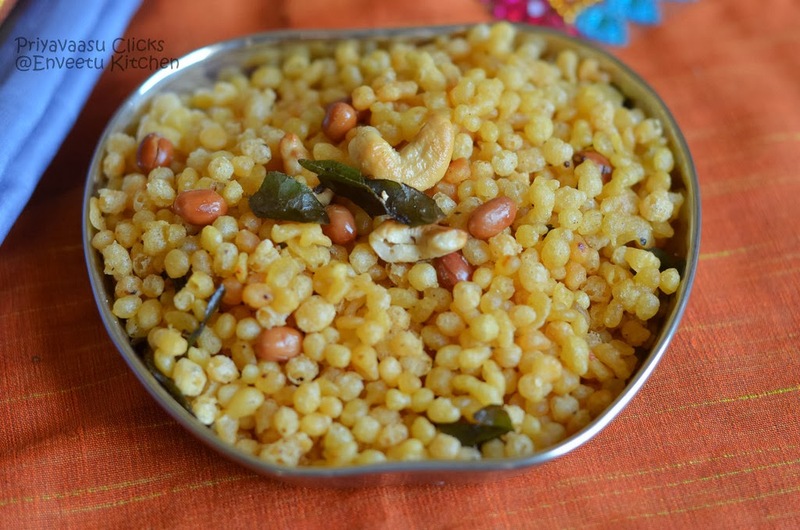 Khichu is a simple Gujarati snack made of Rice flakes cooked with spices. You can even make the khichu ahead of time and steam it for 4 to 5 minutes just before serving. 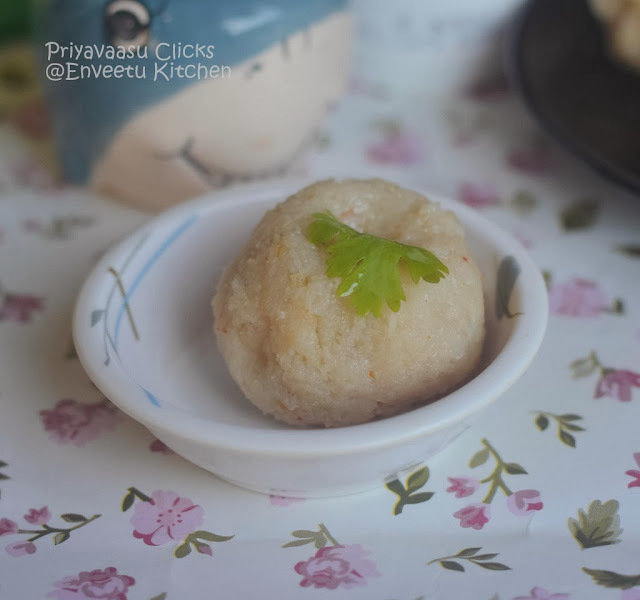 Khichu can even be made with Rice flour. 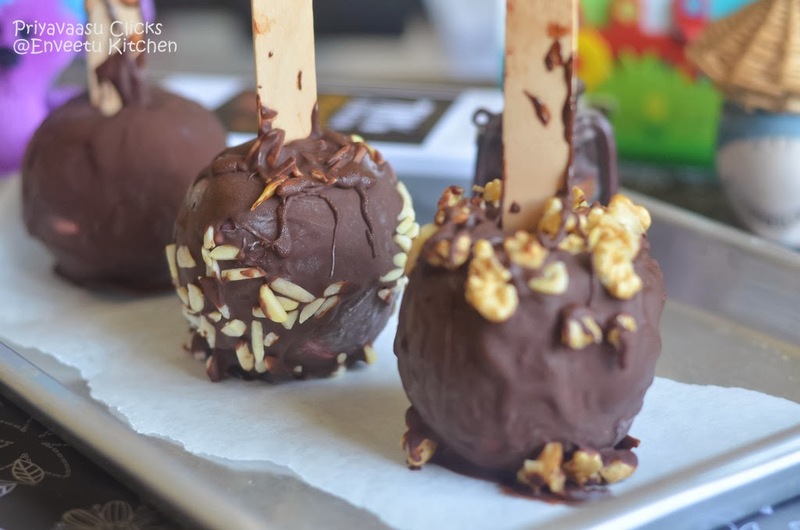 It takes maximum 10 minutes to make this delicious snack. 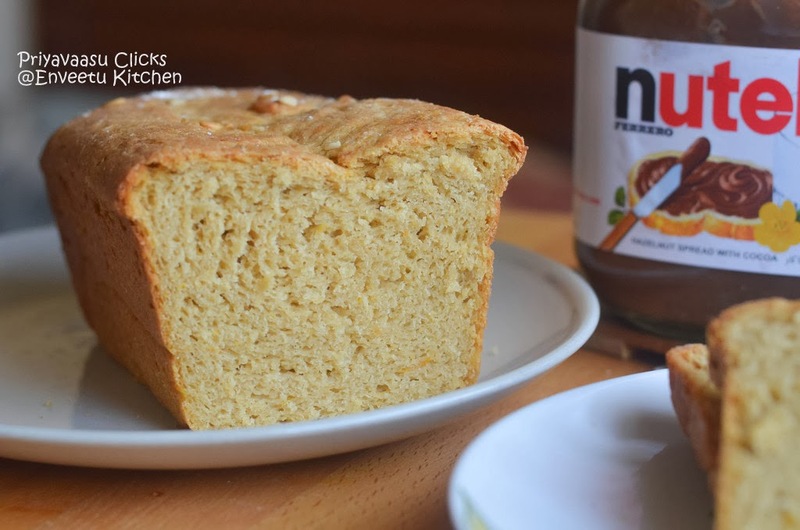 The original recipe doesn't include Coconut, coriander powder and ghee. I have adjusted the recipe to s uit out taste-buds, since i was making this for Bala and Kuttu, i wanted it tobe more kid-pleasing in taste. Take Poha/Rice Flakes in a mixer and Grind it to a coarse powder. It shouldn't be fine powder, should resemble rawa/sooji/semolina in texture. Bring Water to a boil, add red chili powder, coriander powder, salt, cumin, coconut and baking soda. 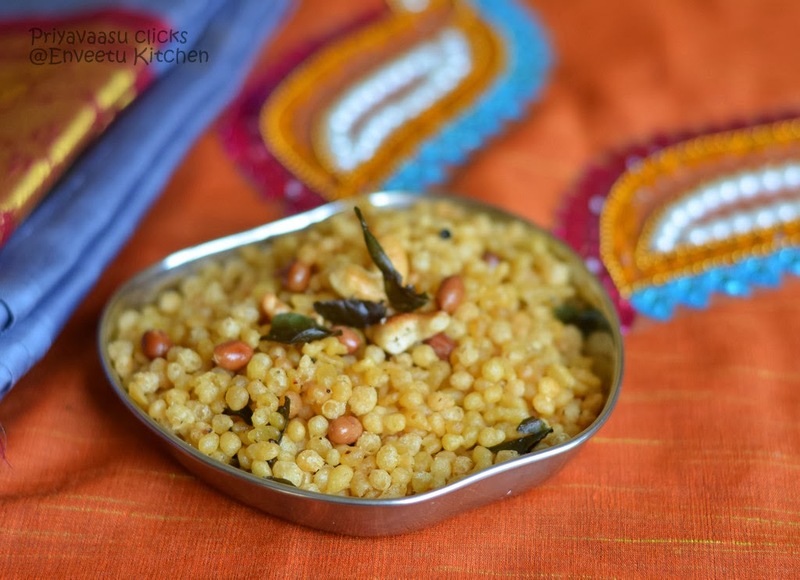 Simmer the boiling water and add the coarsely ground poha/rice flakes to it and mix well. Poha/Rice Flakes will absorb all the water and will come as a mass. Add a tbsp of ghee, close and cook for 2 minutes. Take it off the flame. While it is still warm, shape them into balls. I used my ice-cream scoop for shaping. Place it on a serving plate, make a small dent, pour some ghee into it, garnish with coriander leaves and serve immediately. 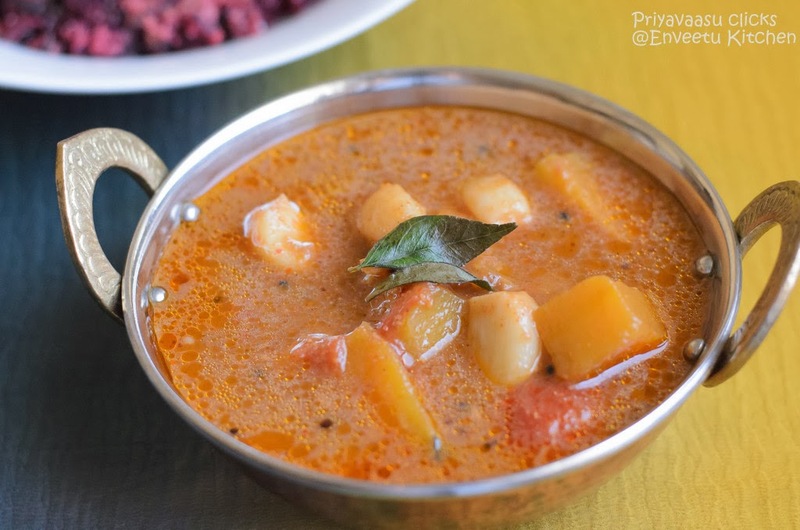 It can be served as such or with little tomato sauce or Mint chutney. A Good evening snack for kids and toddlers. It is Halloween season, so it is raining pumpkin recipes all over the food blogs. yup, this month Baking Partner's Challenge was suggeted by Tamy of 3 sides Crazy. She suggested 2 pumpkin bread recipes from King Arthur Flour website. I chose to bake yeast pumpkin bread.Oh my, we fell in love with this bread. It came out so soft n fluffy, i baked 2 loaves the same day. I stays fresh for a week, when stored properly. It tastes yum when toasted with some cheese n pepper. In a large bowl take flour, yeast,sugar and salt together, whisk well for even mixing add add 1/4 cup warm water, sugar and yeast. Add Pumpkin Puree, warm milk and water and start making a dough. Knead into a soft dough. If needed use the other 1/4 cup of warm water. Oil the bowl well, place the dough in it, cover it with a kitchen towel and let it rise for 1.5 hours or until doubled. After the required time, Take dough out and punch out the air and knead well for a minute shape into a loaf. 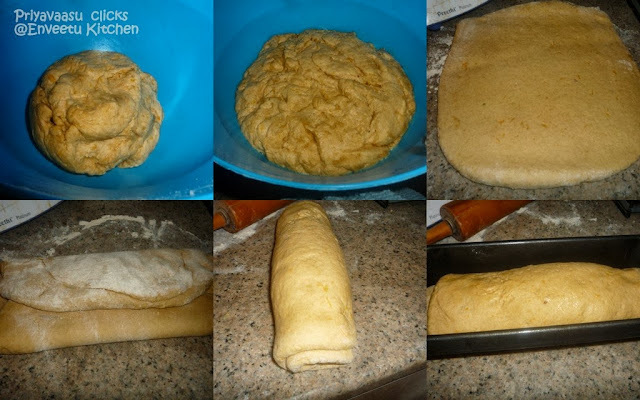 To shape it into a loaf, first roll it in to a rectangle and fold it like an envelope. 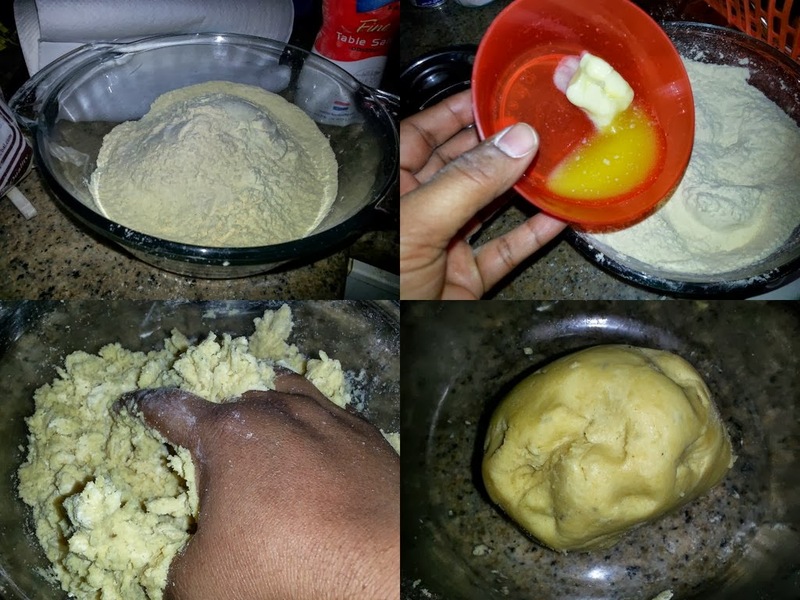 Place shaped dough in a greased bread pan. 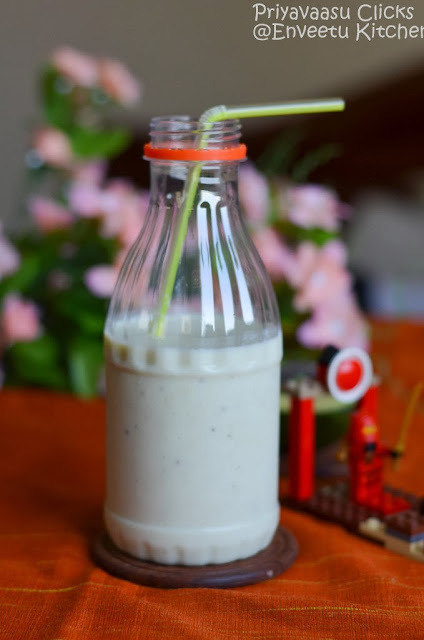 Brush the top with some milk, sprinkle some sesame/melon seeds on top. Let it rise for another 30 minutes.Sprinkle oats on Bake in a preheated oven @ 200C for 35-40 minutes. Remove from pan and cool for 10 minutes before slicing. 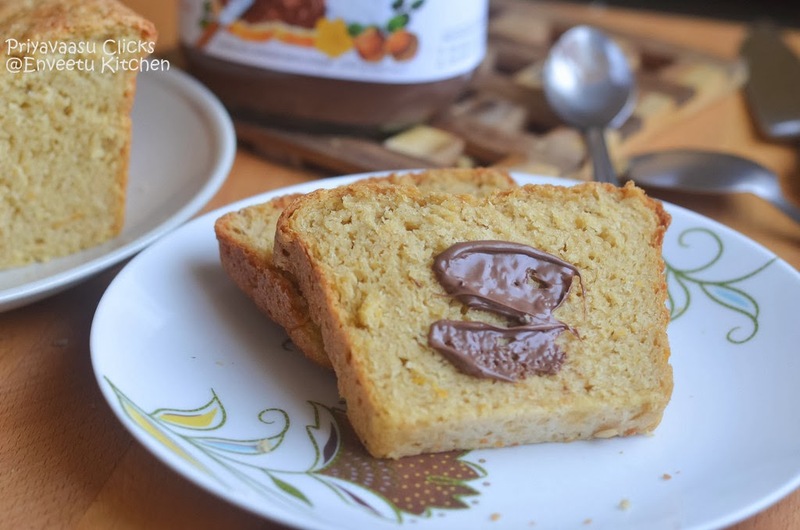 Enjoy warm with a dollop butter/Nutella. Store in the refrigerator for upto a week. 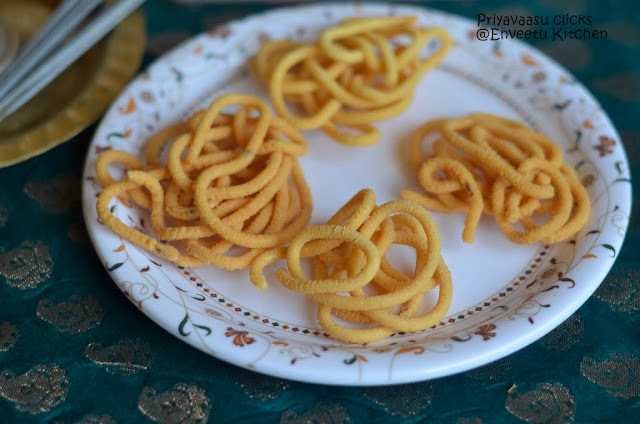 Murukku is our all-time favorite snack. 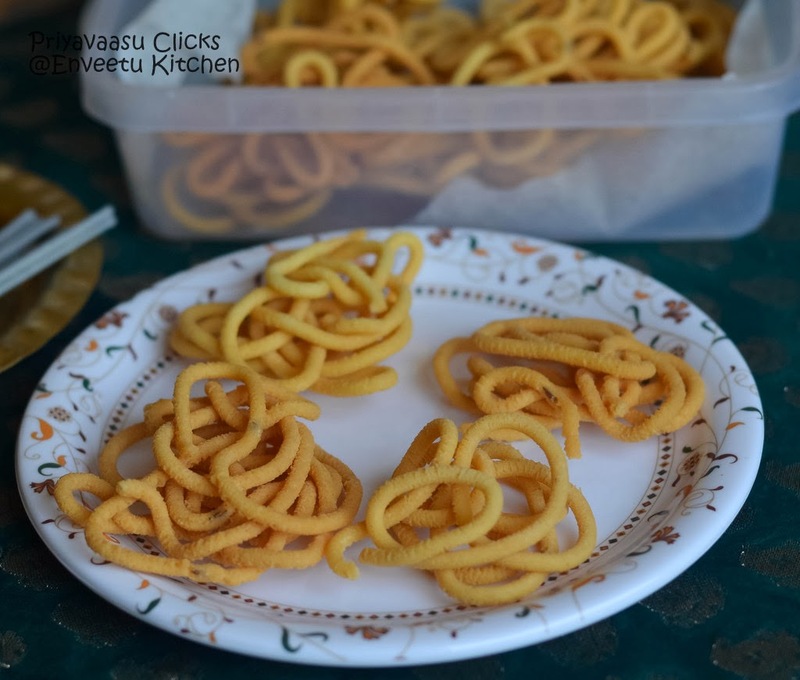 Previously i used to make them often, since kuttu loves to take them for his school snack box. But now with the little one, i m not able to find time to make them at home. 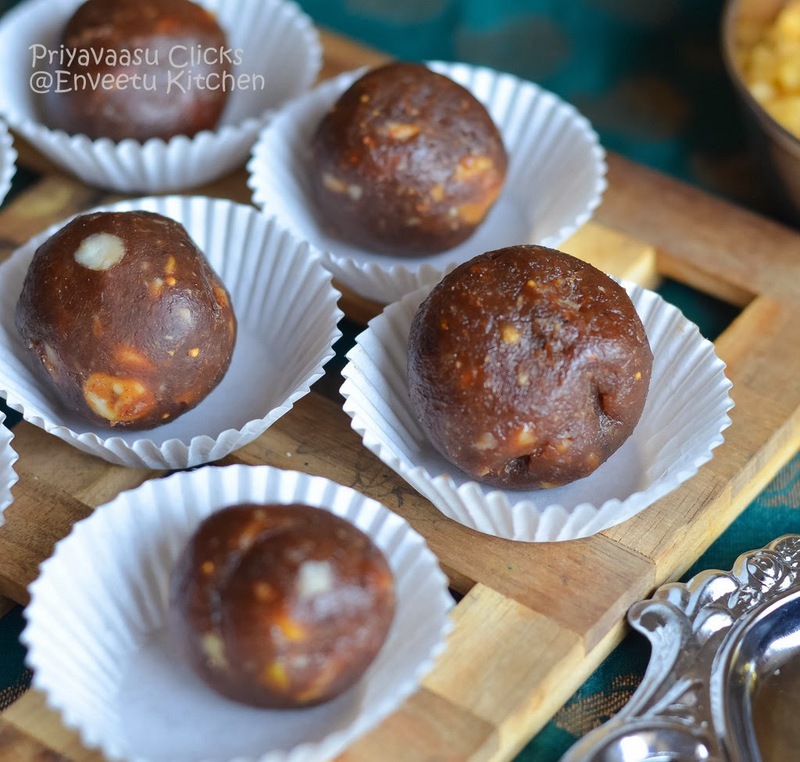 Recently, i found 2 packets of moong dal flour in my freezer, i made some ladoos and with the remaining flour made some crunchy muruku. They turned out pretty well. The little one, keeps pointing to the container, asking for more!!!! Dry roast all three flours separately and in a wide bowl, whisk them together to mix evenly. Add salt and hing to the warm water and mix well.Add cumin/jeera to the flour mix. Add butter to the flour mix and combine together. Now add salt-hing mixed warm water to this and slowly make a dough. Do not add all the water at the same time. Add little by little. You might not require the whole cup. 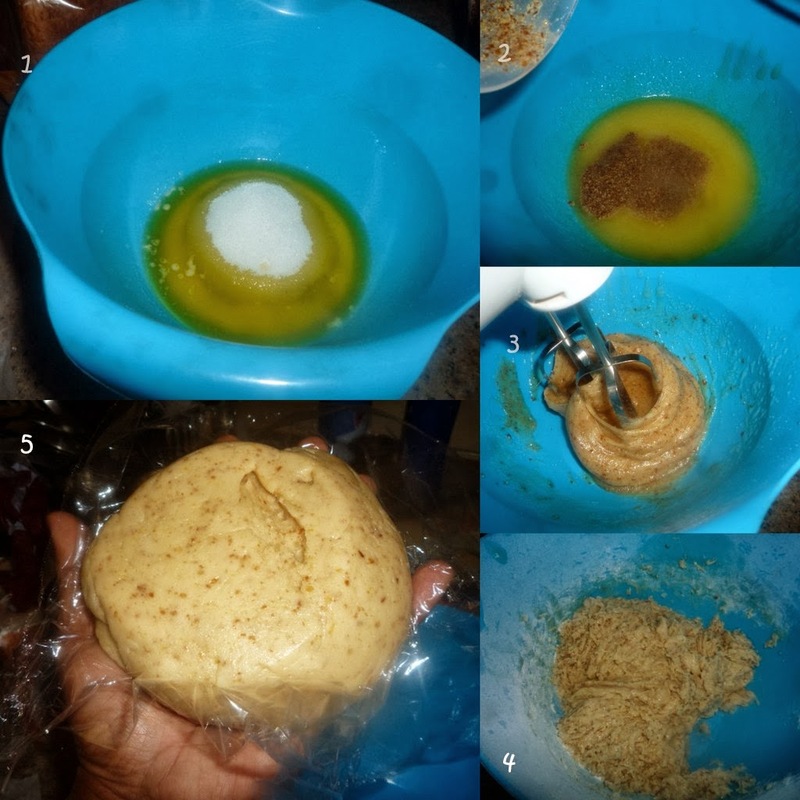 The dough should be soft and pilable and loose enough to be pressed through the murukku/chakkli press. Keep the dough covered until use. Heat oil in a wide kadai/pan for deep frying. Divide the dough into 3 parts. Take one part of the dough. Knead well by sprinkling little warm water and put it in the murukku/chakkli press. I used the 3 - holed mould. You can even use single star mould. Press the dough into the hot oil making small swirls. If you are not comfortable to press in the oil directly, then press murukku at the back of slotted ladddle and drop it in the oil. 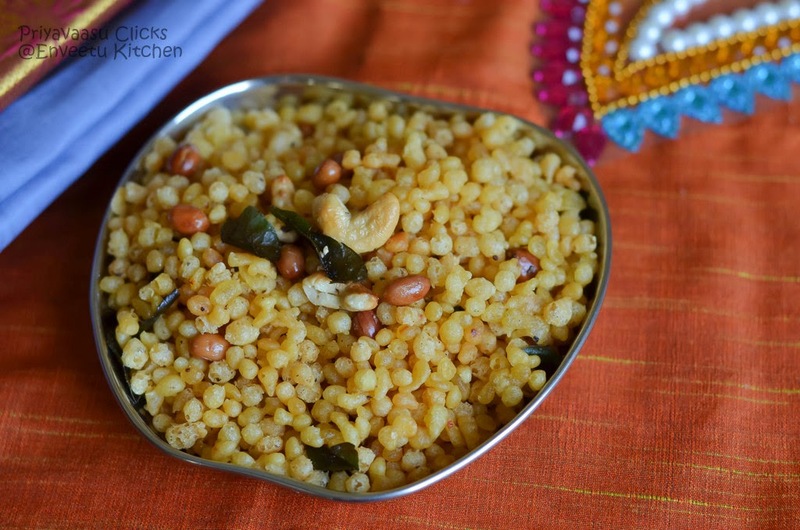 Turn the murukku using a slotted spoon after a minute. When the sizzle seizes, take it out using slotted spoon, and drain on a kitchen towel. Repeat the same with the rest of the dough. When the murukku/Chakkli cooled completely, transfer it to an air-tight container. The Dough tends to go dry, if rested for long. So act quick after making the dough. If it goes dry, sprinkle warm water to the dough and knead well to make it soft. Take care not use more water, just sprinkle. 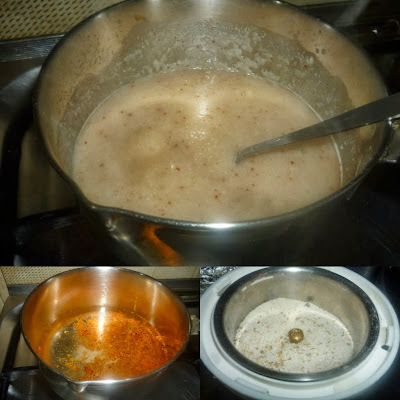 Remove the Murukku from oil, once the sizzle seizes or else the murukku might turn dark-brown. 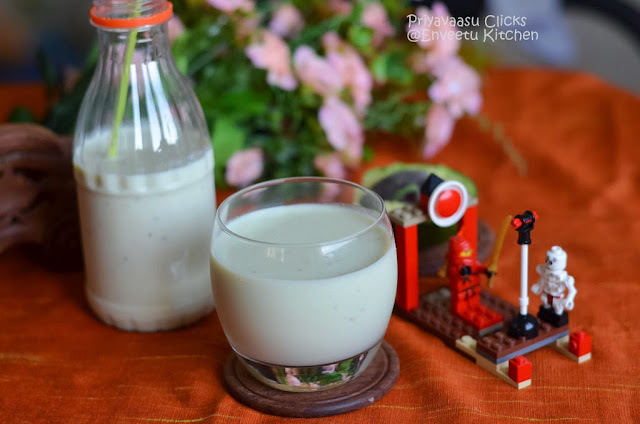 You can add white sesame seeds instead of cumin/jeera. You can even add some crushed garlic/crushed pepper for an extra zing. if using garlic use 2-3 small pods made as a paste. If using pepper, use 1/2 tsp of it. I have some 2 packets of Moong Dal flour, hidden in my freezer all these days.I remember pushing them inside, before going on vacation. Cleaning your freezer,might reveal so many unused groceries, hmmmm!!! So what to do with so much flour? 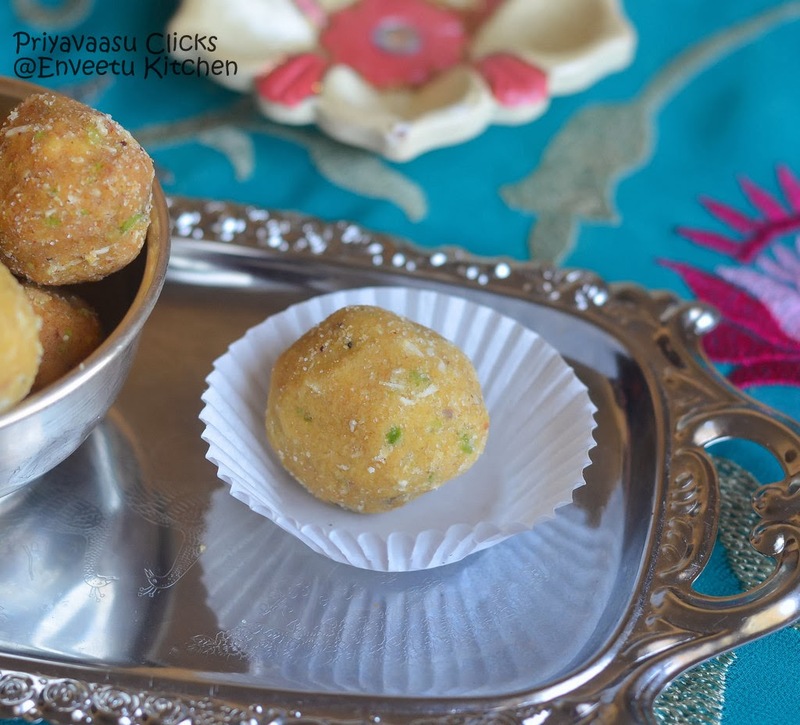 Made some Ladoo's and also some Savory snack, which i will post later. 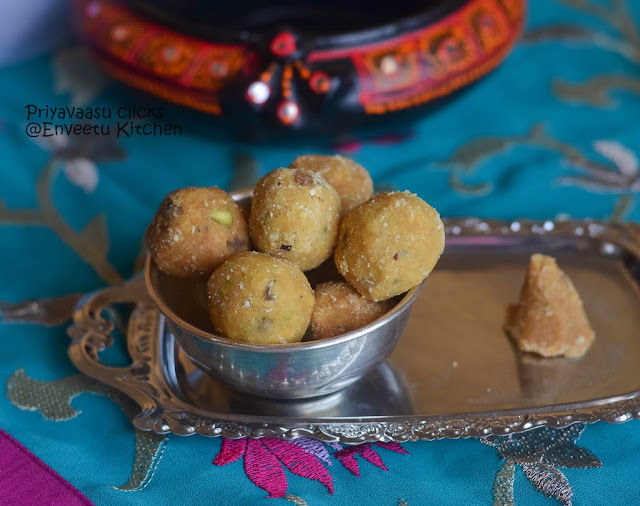 These ladoo's are very quick to make, all you have to do is add ghee and shape them into balls. 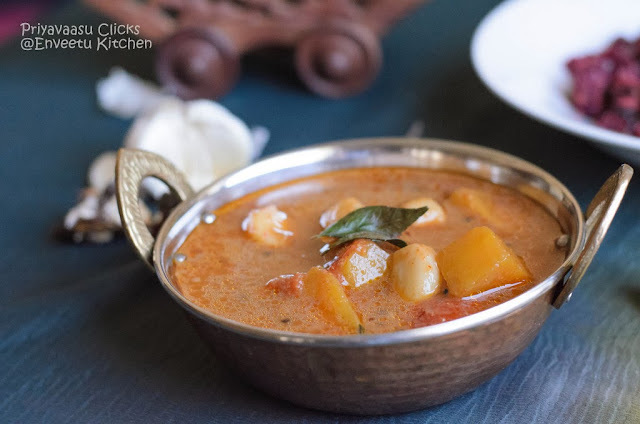 In a Pan, add 2 tbsp of ghee and roast the flour, until it changes to golden color and nice aroma emanates. Take care not to over-roast or burn it. Transfer the flour to a flat plate. Let it cool down a bit. Add Sugar and chopped nuts to this and whisk to mix well. Add a tsp of ghee at time to this mixture and gather it to form a ball/ladoo. Keep it on a flat plate. Repeat the same with the rest of the mixture. To the above measurements i got about 18 ladoos of the size of a ping-pong ball. 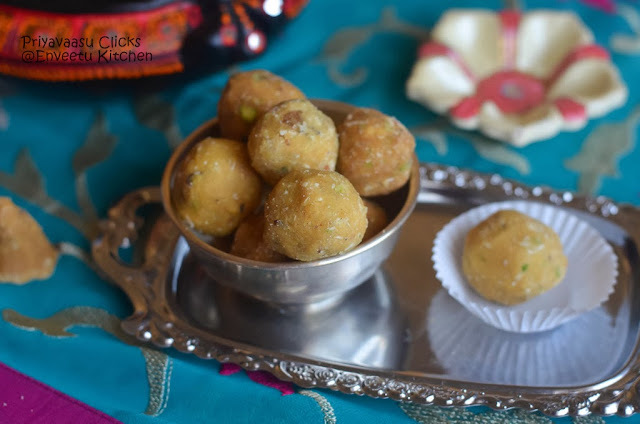 If you make it slightly bigger, you might get about 12-15 ladoos. Let it remain on the Flat plate for 15-20 minutes. Store it in an air-tight container.